I'm noticing a distinct popping sound at the start of every SFX on iOS. The top is iOS and the bottom is Flash. It seems to start playing the sound once or twice on iOS before cutting it off and eventually playing the full sound. I think what is happening here is that on iOS the sound gets played multiple times on the same channel. 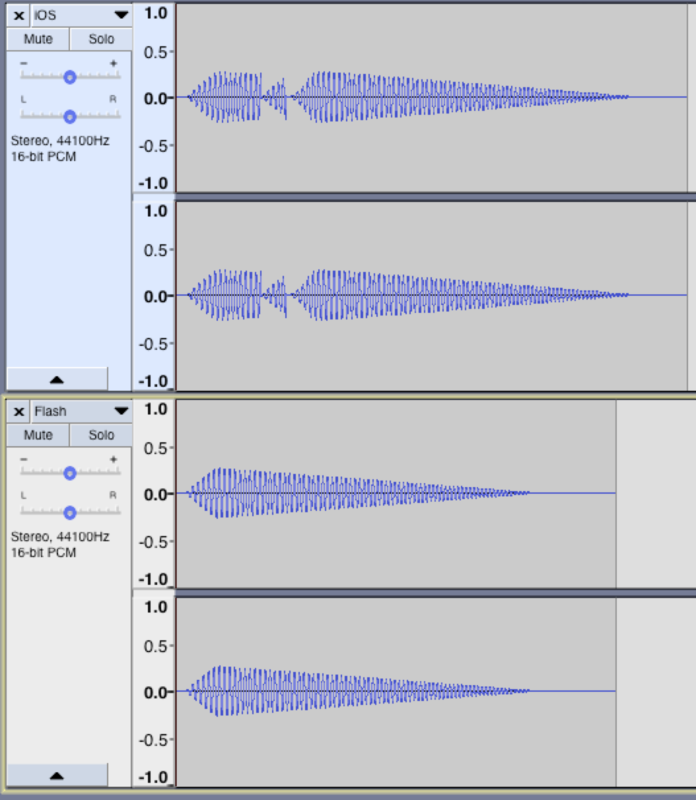 The first play of the sound gets cut off abrubtly during a non-zero waveform amplitude making an audible pop. I've noticed in my own game that some sounds get played multiple times but others don't. I'll see if I can recreate the issue. I have the same issue on iOS! I'm looping a soundtrack and you can hear a pop at the beginning of every loop. Build 10243. Only on iOS.